If you want your homemade cheeses to be entirely covered with blue, don’t just rely on wild Penicillium roqueforti spores: Grow your own fungus on a piece of mouldy bread! Penicillium roqueforti isn’t just to be found infecting cheese. One of the more common household fungi, it’s an opportunistic species that also grows on decaying fruit, old bread and leftovers forgotten in the fridge. As it turns these foods ‘mouldy’ it produces and disperses its fungal spores, which lie in wait for another opportunity to infect its favourite foods, starting the cycle of decay and spore dispersal again. And if it so happens that some of those wild spores land on a cheese, then we’re in for a treat! One of the most insidious and infectious fungi, wild spores of P. roqueforti can ruin entire batches of commercially prepared white-rinded cheeses. This fungus troubles many cheese makers, installing HEPA filters to remove any P. roqueforti spores that may be floating around their dairies and could contaminate their cheeses. Sometimes they even build separate cheese-making facilities to handle P. roqueforti–ripened cheeses, if they make blue cheeses at all. I, however, prefer to embrace this wild fungus, and appreciate the little spots of blue that sometimes appear on my Crottins and Camemberts like manna from heaven. 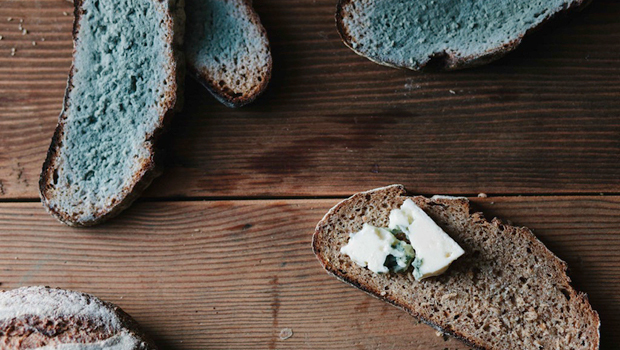 If you want your cheeses to be entirely covered with blue, however, don’t just rely on wild P. roqueforti spores: Grow your own fungus on a piece of mouldy bread! Of course, not just any piece of mouldy bread can be used as a source of P. roqueforti fungus, one of many fungal cultures that flourish on bread. A piece of commercial yeasted bread, left in a plastic bag in your cupboard, will play host to dozens of species of wild fungus looking for food to feed on, many of which might contaminate a blue cheese. Sourdough bread, though, which is naturally resistant to fungal growth because of its acidic nature, limits the growth of most fungal species; but one of the few species that grows well upon sourdough bread is… you guessed it, P. roqueforti. To grow P. roqueforti, inoculate a piece of sourdough bread with a small bit of blue cheese; leave the bread to incubate in a humid environment; and wait for the fungus to consume the bread before drying it. Get some good sourdough bread: Many varieties of sourdough bread available in the grocery store are made with commercial yeast, so they won’t be acidic enough to limit the growth of other fungi. The best way to be sure that the sourdough bread is good? Make it yourself! Inoculate the bread with P. roqueforti: Take a thin slice of bread and spread on it a pea-sized piece of ripe blue cheese, preferably a piece marked with blue, the colour of the microscopic spore-producing bodies of P. roqueforti. Incubate the inoculated bread: Place the P. roqueforti–infected bread into a Tupperware container – the perfect container for growing fungus! Seal the container, and let it sit at room temperature for 1–2 weeks. Check on the bread every few days to observe the spread of the fungus: it will start to grow as slightly raised bumps of white. As the fungus advances over the bread, it forms a ring of fresh white mycelial growth surrounding a zone of mature, greenish-blue fungal spore production; this blue/white colour combination is an identifying trait of the P. roqueforti fungus. Much like when you’re aging a cheese, I recommend flipping the bread regularly, and wiping off any excess moisture from the container to assure that the bread does not get too wet. Dry the blue bread: Once the piece of sourdough bread is completely enveloped in greenish-blue fungal growth, the ‘blue bread’ is ready. The container can then be opened, and the blue bread left to dry for a few days, flipping it to be sure that the bread is fully dried. Once dried, the blue bread can be kept in a jar, and will be preserved for months to years without refrigeration – the fungal spores upon it are remarkably stable. Use your P. roqueforti spores to make blue cheese: Break off a pea-sized piece of the mouldy bread for every gallon (3.7L) of milk; place that small piece of bread into ¼ cup (60ml) or so of water; mix the blue bread into the water to release the spores into it; then pour the water through a strainer over the milk at the beginning of the cheese-making process to introduce the P. roqueforti fungal spores into the cheese. For more on natural cheese making, don't miss Issue 93 ABC Organic Gardener OUT NOW!